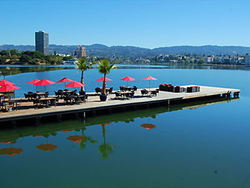 On Thursday, May 12, Vator Splash Spring will bring hundreds of global and local entrepreneurs, media, civic leaders and world-class investors representing more than $40 billion of capital under management to the historic and beautiful Scottish Rite and Lake Chalet, on Lake Merritt. With venture investments down, however, has the mood shifted to fear from greed? Hundreds of VCs will be on hand to share their concerns and their hopes. Some reality-check questions to be discussed: Are VCs asking startups tougher questions? Have valuations been slashed in half? Aren't the best startups born in the down times? The event will not only be a reality check and an enlightening discussion on innovation, but innovation Oakland style as Mayor Libby Schaaf talks about her initiatives to support the tech economy; Oakland-based startups share their success stories on stage and Mitch Kapor shares how he's committed to diverse teams and why they will have the biggest impact in the world. Diversity & Global Impact, Oakland style: Mitch Kapor, iconic entrepreneur and Founder of Kapor Center for Social Impact drives diversity into the heart of his startups and explains how innovation can have the biggest social impact. Fireside chats with CEOs/Founders of Unicorn Startups: Are they starting to scale back and focus more strongly on revenue? Nirav Tolia, Founder & CEO,NextDoor, the $1.1 billion dollar social network connecting neighborhoods; Tom Griffiths, Founder & CPO,FanDuel, the $1 billion dollar fantasy sports site; Andy Dunn, Founder & CEO, Bonobos, which has raised $128 million in financing; Oisin Hanrahan, Founder & CEO, Handy, which has raised $110 million in VC. How are on-demand, zero-waste startups shaping our labor market, economy and culture? Discussion among Founders and CEOs of: YourMechanic, Zirx, Trucker Path,TaskEasy, Vinted, SpotHero, Tripping, and Deliv. Showcasing Oakland/East Bay startup success stories and promising upstarts: Talks from Brett Wilson, Founder & CEO of TubeMogul, which IPO’d in 2014; Joel Flory, Founder & CEO of VSCO, which raised $70 million in venture financing; Diishan Imira, Founder & CEO, Mayvenn; Liz McMillan, CEO of Dictionary.com; 5 promising Oakland’s Rising Stars - Saint Harridan, Clef, NPM, Qeyno Labs, and Angeloop. Highlights of Investor/Investing panels (estimated 300 investors to gather): With VC investments slowing down, how long will the slump continue and how many more startups and venture firms will die before yearend; How are venture models changing? Is there anyting being funded? Now that there isn't a glut of seed-stage startups looking for Series A, what's the role of the Post Seed investor? Is FinTech the only hot sector in 2016? VCs from the following firms will discuss: DJF, IVP, Karlin Ventures,Susa Ventures, VTF Capital, Palo Alto Venture Science, IDG, Mucker Capital, Bullpen Capital, Rincon Venture Partners, Freestyle VC, Subtraction Capital, Khosla Ventures, Greylock, Javelin Venture Partners, Base VC, Illuminate Ventures, InterWest Partners, Better Ventures, Propel.VC, Core.VC,Clocktower Ventures, and Montage Ventures. Splash Spring sponsors include: KPMG, SAP Startup Focus Program, Kapor Center for Social Impact, Javelin Venture Partners, Dictionary.com, Avison Young, TubeMogul, Wendel Rosen, Lyft, Visit Oakland, Oakland Chamber of Commerce and the City of Oakland. Please request your press pass by May 11. Follow these links to the full agenda. Email press(at)vator(dot)tv for passes and interview requests.